Twenty years ago, kids in preschool, kindergarten and even first and second grade spent much of their time playing: building with blocks, drawing or creating imaginary worlds, in their own heads or with classmates. But increasingly, these activities are being abandoned for the teacher-led, didactic instruction typically used in higher grades. 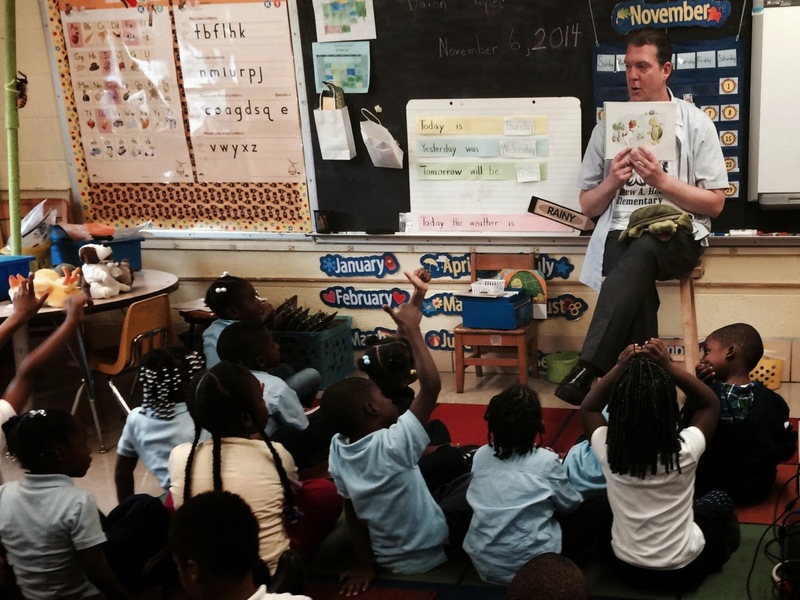 In many schools, formal education starts at age 4 or 5. Without this early start, the thinking goes, kids risk falling behind in crucial subjects such as reading and math, and may never catch up. By many measures, American educational achievement lags behind that of other countries; at the same time, millions of American students, many poor and from minority backgrounds, remain far below national norms. Advocates say that starting formal education earlier will help close these dual gaps. Of course, these countries are smaller, less unequal and less diverse than the United States. In such circumstances, education poses fewer challenges. It’s unlikely that starting school at 7 would work here: too many young kids, disadvantaged or otherwise, would probably end up watching hours of TV a day, not an activity that promotes future educational achievement. But the complexities of the task in this country don’t erase a fundamental fact that overly structured classrooms do not benefit many young children. Some research indicates that early instruction in reading and other areas may help some students, but these boosts appear to be temporary. A 2009 study by Sebastian P. Suggate, an education researcher at Alanus University in Germany, looked at about 400,000 15-year-olds in more than 50 countries and found that early school entry provided no advantage. Another study by Dr. Suggate, published in 2012, looked at a group of 83 students over several years and found that those who started at age five had lower reading comprehension than those who began learning later. Other research has found that early didactic instruction might actually worsen academic performance. 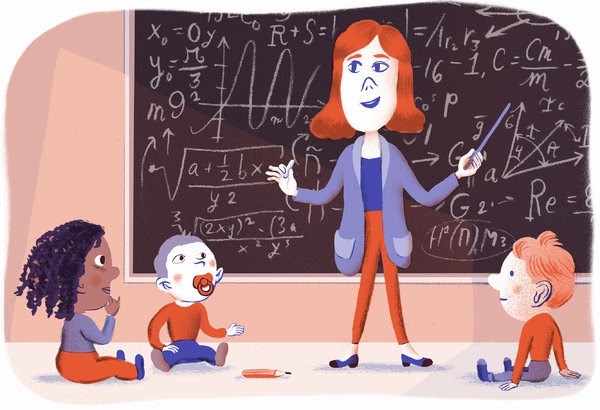 Rebecca A. Marcon, a psychology professor at the University of North Florida, studied 343 children who had attended a preschool class that was “academically oriented,” one that encouraged “child initiated” learning, or one in between. 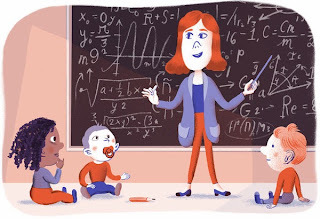 She looked at the students’ performance several years later, in third and fourth grade, and found that by the end of the fourth grade those who had received more didactic instruction earned significantly lower grades than those who had been allowed more opportunities to learn through play. 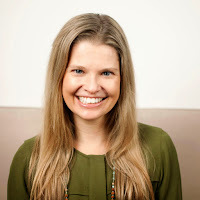 Children’s progress “may have been slowed by overly academic preschool experiences that introduced formalized learning experiences too early for most children’s developmental status,” Dr. Marcon wrote. Nevertheless, many educators want to curtail play during school. Reading, in particular, can’t be rushed. It has been around for only about 6,000 years, so the ability to transform marks on paper into complex meaning is not pre-wired into the brain. It doesn’t develop “naturally,” as do other complex skills such as walking; it can be fostered, but not forced. Too often that’s what schools are trying to do now. This is not to suggest that we shouldn’t increase access to preschool, and improve early education for disadvantaged children. But the early education that kids get — whatever their socioeconomic background — should truly help their development. We must hope that those who make education policy will start paying attention to this science. David Kohn is a freelance science writer based in Baltimore. We all live, first and foremost, on the inside of our human bodies. But that doesn’t mean that rich inner life we all have doesn’t project itself outward into the everyday world. Quite the opposite: our emotional responses are hard to navigate at any age. Figuring out how and what you are physically feeling is particularly challenging when you’re feeling things like rage, sadness, disgust and confusion for the first time. Heck, this particular Smart Girl is 29-years-old and I still have a hard time understanding what it all means. Sometimes, though, the best thing to do is just breathe. Which is exactly what’s at the heart of the matter in this short from filmmakers Julie Bayer Salzman and Josh Salzman titled “Just Breathe.” In the 4-minute long video, the duo spoke to several young Smart Girls and Boys about how their emotions affect them and how they physically feel. But rather than just opening up the conversation — which is great and also, hint hint nudge nudge, part of what we’re doing with #BeEmotionalInsideOut — the duo show how helpful the practice of mindfulness is in keeping kids emotionally healthy. How do you deal with your emotions when you’re upset? Have you found any tricks and tips that help you be emotionally healthy and honest? Let’s hear ‘em in the comments (or on Twitter. Make sure to tag them #BeEmotionalInsideOut)! Advocate Catherine Mayes of Mass. Advocates for Children and NESCA Transition Specialist Marilyn Weber speak today at a meeting of the MA Coalition to Defend Special Education on life coaching to help individuals develop independent living skills in the community, at school, at work and at home. Their talk takes place today from 10:00am to 12:00 noon at the Boston Foundation, at 75 Arlington Street in Boston. 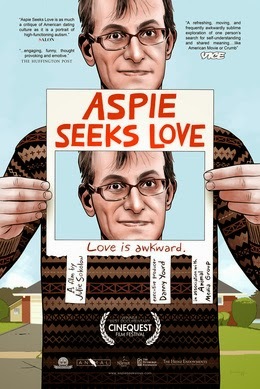 As AANE begins its 20th year, we would like to celebrate at our annual meeting by showing the new, not-yet-released documentary film "Aspie Seeks Love" on June 9th at Hebrew College in Newton Center, from 7:00 - 8:15pm. The annual meeting will follow, from 8:15 - 9:15pm. Both the Nancy Lurie Marks Family Foundation and the Ruderman Family Foundation have made $500 contributions so that we can offer tickets to members of our community at no charge. In order to figure out how many tickets will be available for these guests, we need to know how many tickets to reserve for board and committee members and guests you might want to bring. Please RSVP. Your receipt will be your ticket. Please do not sign up to come unless you are sure you will attend -- seating is limited. Thanks to the Nancy Lurie Marks Family Foundation and the Ruderman Family Foundation for sponsoring this movie. Two one-week intensive programs this summer, helping new students on the autism spectrum transition into college. Read about a young man in college who attended the program: The Courage to Thrive in College. Contact information: tel. (781) 860-1900; email: mghaspire@partners.org. Therapeutic Yoga Opportunities at NESCA This Summer! If you have been considering therapeutic yoga for your child but have had trouble fitting it into your busy school year, summer can be the ideal time to bring yoga into your child's life. Our therapeutic yoga teachers can introduce your child to yoga, help them develop valuable self-awareness and self-regulation skills and lay the foundation for a lifelong healthy practice. We offer flexible scheduling in the summer, and do our best to work around camp and vacation plans. Limited spaces are still available for individual therapeutic yoga sessions as well as the Yoga Connects parent-child program for children and young adults with ASD and other developmental challenges. 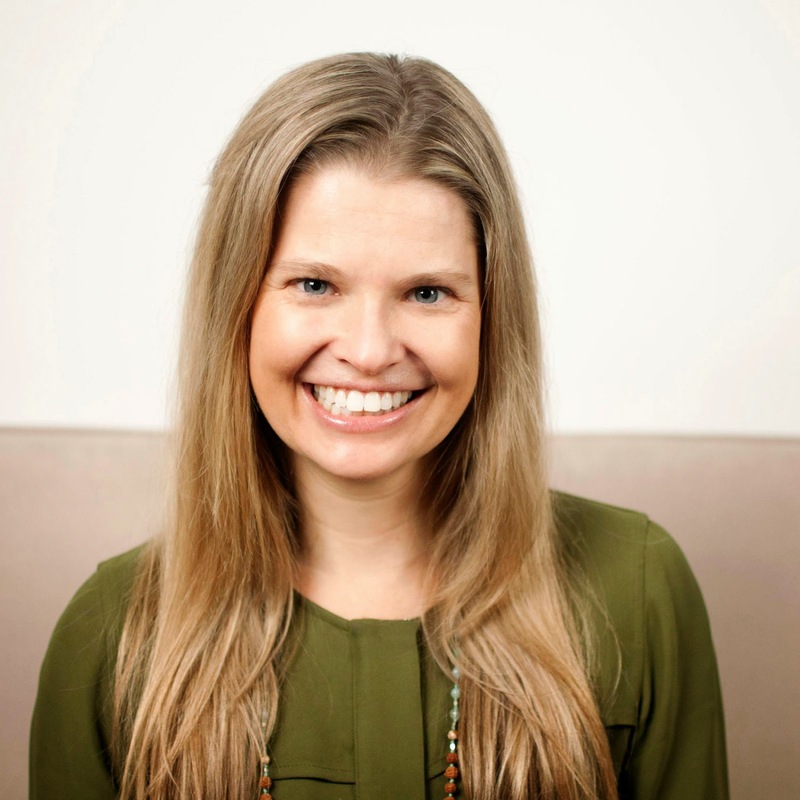 In addition to these ongoing services, School Guidance Counselor and Certified Yoga Instructor Ann-Noelle McCowan is offering two special summer programs specifically designed to support girls ages 9-12 and their parents. NESCA receives many inquiries about our yoga program from families with daughters aged 9-12. 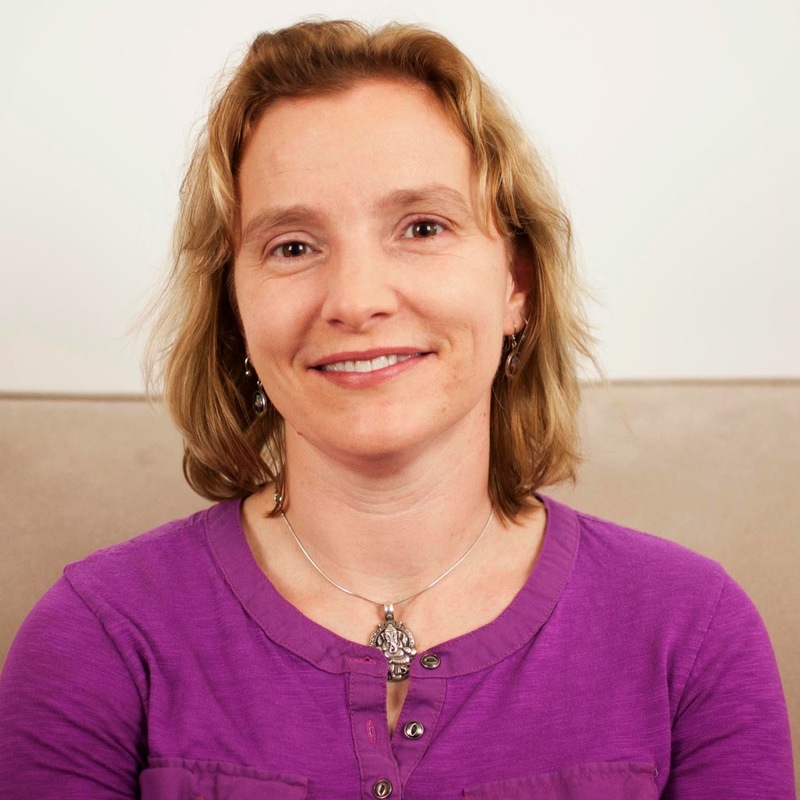 This doesn't surprise therapeutic yoga teacher Ann-Noelle McCowan, M.S., RYT, a school counselor who has been working with pre-teens and teens since 2001. Beginning during the later elementary years, girls experience increased academic expectations, growing awareness of how they compare to others, stronger and more complex social relationships, developing independence from family, and the onset of puberty with its accompanying mood fluctuations and sense of their body and body image. This is a challenging time for parents as well as they navigate how best to stay connected to their child while supporting their transition into the teenage years. Self-awareness and empowerment group: For girls ages 9-12. This six-week summer class includes yoga practice, mindfulness exercises, yoga games, group discussion and guided relaxation. Participating girls will build a solid toolbox of self-awareness and self-regulation strategies. Be strong, be calm and have fun! Parent group: For parents of girls ages 9-12. In this four-week evening series, Ann-Noelle will provide invaluable insight from her 14 years of working with pre-teens, teens and their parents into what is happening developmentally, emotionally and socially with your pre-teen girl. Learn strategies to understand and communicate peacefully with your daughter, enjoy the support/validation from a confidential cohort of parents and then enjoy a chance to relax and take care of yourself. Sessions will include some lecture, group discussion and gentle yoga practice. No yoga experience is necessary. Both groups will begin after July 4th, with specific times and days TBD based on interest and availability. To register or for more information about these groups or our other therapeutic yoga services, contact Hannah Gould, at hgould@nesca-newton.com or 617-640-0450. Kids often keep their worries hidden, or express them in ways that are hard to read. Anxiety is a natural thing. It is normal for very young children to be afraid of the dark, or for school-age children to worry about making friends. But for some kids, normal anxiety morphs into something more serious. A young girl might be afraid to ever leave her mother's side, even to get on the school bus, or an anxious boy may need frequent reassurance over things that happened a month ago. Kids can develop an anxiety disorder. Eventually the disorder can start interfering with a child's friendships, life at home, and work in school. Even so, the anxiety still might not be noticeable to parents and caregivers. For one thing, being anxious doesn't necessarily mean that you can't function—it might just make some kinds of functioning more difficult. A homework assignment that should take twenty minutes might take an hour, for example. With anxiety, it's important to remember how internal it is. It dominates a child's thoughts, but it might not be obvious to the people around her. It's also worth noting that in my work as a child psychiatrist I see a lot of anxious kids who are still basically happy and enjoying life. Maybe they are only struggling in certain situations, which may make their anxiety all the easier to overlook. When anxiety is expressed outwardly, there can be a wide range of signs, which often complicates identification. They might also have trouble focusing in class or be very fidgety—I like to say, "Not all that moves is ADHD," even though that's often the first thing we suspect from a hyperactive or inattentive child. The words we use to describe our anxiety can distract, too. People use a lot of different words to describe what they're feeling—kids might say they are self-conscious, shy, apprehensive, worried, or afraid. These words do a good job capturing what they are struggling with, but fixating too much on them can distract from the fact that anxiety is underlying factor—not some personal failure in personality. If you look at the prevalence rates of anxiety disorders, you'll see that the numbers rise as children get older. That makes sense because anxiety disorders are cognitive, so they develop as our cognitive ability develops. Separation anxiety, for instance, develops early, whereas social anxiety disorder usually develops after puberty. A study of more than 10,000 kids, interviewed by trained professionals, shows that more than 30 percent had developed an anxiety disorder some time before they were 18. Anxiety frequently recurs, too, and childhood anxiety is often a precursor for adult anxiety, especially for kids who don't receive treatment. The same study showed that 80 percent of kids with anxiety do not get treatment. Many adults seeking help for anxiety remember feeling anxious when they were younger, which means that they've been struggling for a long time and could have benefited from treatment as children. Kids with untreated anxiety also begin to develop poor coping skills. A common example is avoidance—people who are very anxious will try to contain it by avoiding the thing that makes them anxious. It's a short-term solution that unfortunately reinforces their anxiety instead of acclimating them to it. Similarly, untreated anxiety can lead to lower self-esteem, academic dysfunction and self-medication through substance abuse. People living with anxiety for extended periods of time are also more likely to develop depression. It isn't uncommon to meet patients who come seeking treatment for depression or depressive symptoms and it turns out that they have been dealing with lifelong anxiety as well. In cases like this people need treatment for anxiety and depression. Fortunately, we know a lot about how to treat anxiety. It responds very well to cognitive behavior therapy, and there are medications that work, too. Getting help makes a big difference, and treatment doesn't need to be a lifelong thing—although its positive effects will be. Are you a pen-clicker? A hair-twirler? A knee-bouncer? Did you ever get in trouble for fidgeting in class? Don’t hang your head in shame. All that movement may be helping you think. A new study suggests that for children with attention disorders, hyperactive movements meant better performance on a task that requires concentration. The researchers gave a small group of boys, ages 8 to 12, a sequence of random letters and numbers. Their job: Repeat back the numbers in order, plus the last letter in the bunch. All the while, the kids were sitting in a swiveling chair. For the subjects diagnosed with attention deficit hyperactivity disorder, or ADHD, moving and spinning in the chair were correlated with better performance. For typically developing kids, however, it was the opposite: The more they moved, the worse they did on the task. Dustin Sarver at the University of Mississippi Medical Center is the lead author of this study. ADHD is his field, and he has a theory as to why fidgeting helps these kids. That’s right — increasing. The prevailing scientific theory on attention disorders holds that they are caused by chronic underarousal of the brain. That’s why stimulants are prescribed as treatment. Sarver believes that slight physical movements “wake up” the nervous system in much the same way that Ritalin does, thus improving cognitive performance. However, he explains, alertness occurs on a “rainbow curve.” You want to maintain a “Goldilocks” level of alertness — not too much, not too little. That’s why moving around didn’t help the typically developing kids; it might even have distracted them. This is one small study, not meant to provide conclusive evidence one way or another. But in his role as an ADHD researcher, Sarver often finds himself in conversation with teachers who ask him for his opinion. Sarver tells them that it may make more sense to grant kids with ADHD some leeway — not to get out of their desk constantly or distract other students, but to move around as they need to. From Education Week's Blog "Early Years"
A small percentage of children who had been diagnosed with autism spectrum disorder as toddlers no longer showed symptoms of the disorder four years later, but most continued to have emotional or learning disorders, according to a study that was presented at a recent meeting of researchers in child health. The findings came from a study of 569 children in New York between 2003 and 2013. They had all been diagnosed with autism spectrum disorder through an early-intervention program around age 2 1/2. But 38 children—about 7%—showed no further signs of autism as young children when they were 6 years old. Those 38 children did have normal cognitive function, but many, about 68 percent, also had learning disabilities. Nearly half had attention deficit hyperactivity disorder, and a quarter had disabilities such as anxiety, obsessive compulsive disorder, or selective mutism. Only three of the 38 had no other diagnoses. Nearly 75 percent of the children required academic supports, such as a small classroom or a resource room setting, according to the findings. The findings were presented Sunday at the Pediatric Academic Societies meeting in San Diego. The research was led by Dr. Lisa Shulman, a developmental pediatrician and a specialist in early identification and treatment of autism, based at the Albert Einstein College of Medicine at Yeshiva University in New York. "When an early ASD diagnosis resolves, there are often other learning and emotional/behavioral diagnoses that remain," said Dr. Shulman, in an interview with AAP News, a news magazine published by the American Academy of Pediatrics. "Understanding the full range of possible positive outcomes in this scenario is important information for parents, clinicians, and the educational system." You may wonder how clinicians are able to diagnose autism accurately very young children. Dr. Shulman and the Albert Einstein College of Medicine created this video of baby and toddler milestones that offers a good primer on social behavior and language development parents should expect from their children at different ages. What makes this video particularly useful is that it features real children as well. Alithea Morrison, second from right, sits next to her preschool teacher, Kathy Boisvert, as she and her classmates sing during class at Millville Elementary School in Millville, Mass. 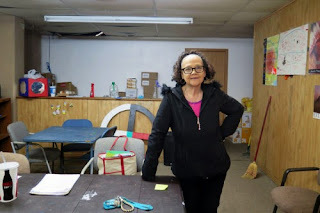 The class is one of more than 100 school sites for the Learning Experiences Alternative Program, which immerses children with autism spectrum disorders in classes with typically developing children trained in ways to communicate and work with them. Thomas O’Donnell’s kindergarten kids are all hopped up to read about Twiggle the anthropomorphic turtle. “Who can tell me why Twiggle here is sad,” O’Donnell asks his class at Matthew Henson Elementary School in Baltimore. “Because he doesn’t have no friends,” a student pipes up. And how do people look when they’re sad? “They look down!” the whole class screams out. So shouldn’t schools teach kids about emotions and conflict negotiation in the same way they teach math and reading? The creators of Twiggle the Turtle say the answer is yes. Twiggle is part of a program called Promoting Alternative Thinking Strategies, or PATHS. It’s designed to help young kids recognize and express emotions. O’Donnell says his students are really taking to the lessons. They’re trained, for example, to “do the Turtle” when they’re upset. “That’s when they stop and cocoon themselves. They wrap their arms around themselves and they say what the problem is,” he explains. O’Donnell’s kids do the turtle all the time — in the hallway and during class. While most kids will eventually figure out such strategies on their own, or with help from their parents, O’Donnell says, the lessons help them learn more quickly. So Kenneth Dodge, a psychologist at Duke University, asked, “Could we do something about that to prevent those problems from actually occurring?” And he has dedicated his career to answering that question. He and his colleagues launched the FastTrack Project to see if they could change students’ life trajectory by teaching them what researchers like to call social-emotional intelligence. By age 25, those who were enrolled in the special program not only had done better in school, but they also had lower rates of arrests and fewer mental health and substance abuse issues. The results of this decades-long study were published in September in the American Journal of Psychiatry. PATHS and FastTrack aren’t the only programs of their kind. A social-emotional learning program called RULER, developed at Yale University, has shown promising results, as well. And every year, the Chicago-based Collaborative for Academic, Social and Emotional Learning rates the top evidence-based emotional intelligence programs around the country. So what’s the catch? Why don’t all schools offer emotional intelligence lessons? At Clark K-8 School in Cleveland, fifth-grader Tommy DeJesus Jr. says he thinks it’s been worthwhile. The other day, for example, DeJesus says, he was quick to step in when he saw that a friend was being teased. “They were making fun of his shoes and how he dressed. I said, ‘Just because you have shoes and he doesn’t, that doesn’t give you the right to bully him,’ ” he says. At a Glance: Children can be gifted and also have learning and attention issues. Many of them go through school without being identified as having special talents or needs. You can help your child get more support. Many parents are all too familiar with this kind of comment. You may hear it from friends. From family. Even from some teachers and doctors. Yet there are lots of people who have exceptional ability in some academic areas and significant learning difficulties in other areas. Educators use a special name to describe students who qualify for gifted programs as well as special education services. These children are referred to as “twice-exceptional” learners. Some organizations estimate that there are hundreds of thousands of twice-exceptional learners in U.S. schools. Consider Tessa: She’s a bright, insightful and enthusiastic fourth grader who is reading at a 12th-grade level. At the same time, she can’t pass her spelling tests, and writing is a huge struggle. Consider Jamie: At 16, he knows everything about the Civil War, writes beautifully, and can talk endlessly about politics. Yet he needs a calculator to help him with even the most basic math. And he couldn’t tie his shoes until he was in seventh grade. Consider Steven Spielberg: He’s one of the most successful filmmakers of all time, but reading has been a lifelong struggle for him because he has dyslexia. Some groups estimate that there are hundreds of thousands of twice-exceptional learners in U.S. schools. But there are no hard numbers because so many of these students are never formally identified as being gifted, having a disability or both. Students whose learning and attention issues and giftedness mask each other.These kids may appear to have average ability because their strengths and weaknesses “cancel each other out.” Consequently, these students may not qualify for gifted programs or for special education programs. Federal law protects students with disabilities. School districts are required to look for children with disabilities and provide special education to those who qualify for it. Gifted education is a different animal. There is no federal requirement for gifted education. Decisions about gifted programming are made at the state and local level. Few states specify what these services should be and which talents should be nurtured. This is often left up to individual school districts. And funding for gifted services can vary greatly from district to district. Identifying twice-exceptional students tends to be a low priority. Often it takes a proactive parent to push for testing for both giftedness and learning and attention issues. But sometimes teachers are the first to raise the possibility. Signs of a processing disorder, such as having trouble following spoken directions or stories that are read aloud. 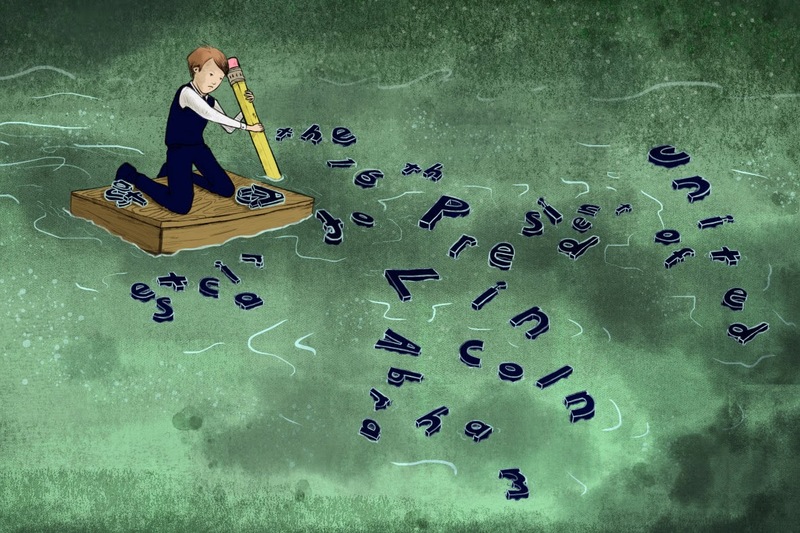 There isn’t a simple, one-test way of identifying twice-exceptional children. Ask your child’s school how it evaluates kids for giftedness and learning and attention issues. The process will likely include assessing your child’s strengths and weaknesses as well as observing him in class and other settings. It may be helpful for you and the teachers to keep records of what your child excels in and struggles with. Be on the lookout for “disconnects” between how hard he’s studying and what kinds of grades he’s making. Giftedness can add to the social and emotional challenges that often come along with learning and attention issues. Frustration: This is especially common among kids whose talents and learning issues have gone unnoticed or only partially addressed. These students may have high aspirations and resent the often-low expectations that others have for them. They may crave independence and struggle to accept that they need support for their learning and attention issues.Like many gifted students, twice-exceptional learners may be striving for perfection. Nearly all the students who participated in one study of giftedness and learning disabilities reported that they “could not make their brain, body or both do what they wanted to do.” No wonder these kids are frustrated! Low self-esteem: Without the right supports, children with learning and attention issues may lose confidence in their abilities or stop trying because they start to believe that failure is inevitable. This kind of negative thinking can add to the risk of depression. Social isolation: Twice-exceptional kids often feel like they don’t fit into one world or another. They may not have the social skills to be comfortable with the students in their gifted classes. They may also have trouble relating to students in their remedial classes. This can lead twice-exceptional learners to wonder, “Where do I belong?” These children often find it easier to relate to adults than to kids their age. Talk to the school. If you suspect your child may be twice exceptional, request a meeting with the school’s special education coordinator. Discuss your concerns, and ask about types of tests. Make the most of your child’s IEP. If the school determines that your child is twice exceptional, use the annual goals in his Individualized Education Program (IEP) to address his weaknesses and nurture his gifts. Be prepared to brainstorm—and to be persistent! By partnering with your child’s teachers, you can help your child develop his talents and achieve his full potential. Learn more about how to be an effective advocate for your child at school. Explore Parenting Coach for strategies on how to handle frustration and other everyday challenges. With your love and support, your child can move ahead and make the most of his gifts. Twice-exceptional children are often at risk for social and emotional challenges. Your child’s IEP can address his weaknesses and nurture his strengths. Free Talk Thursday, May 14th in Holliston: Transition Planning - What Comes after High School for Children with Special Needs? Strategies for including assessment information in Transition Plans and IEPs. NOTE: This talk has been moved from the library to Room 303. After entering through the main high school entrance, take the first hallway on the right, after the library. Prior to the stairs, take the left down the hallway. Room 303 is the first classroom on your right, after the back wing hallway. Transition is the process, ideally beginning at age 14 if not sooner and extending through high school graduation and beyond, by which an adolescent or young adult masters the life skills necessary to function independently in post-secondary school or the workplace. 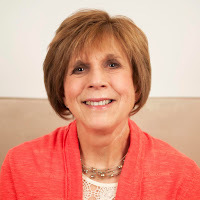 NESCA offers complete transition assessment (including testing and community-based observation), consultation, planning, coaching and college selection services, coordinated by Kelley Challen, Ed.M., CAS. Other members of NESCA's transition team include Jason McCormick, Psy.D., Sandy Storer, MSW and Marilyn Weber. Learn more HERE! While recovering from the symptoms of a concussion, a vast majority of students reported having one or more issues that impaired their academic work, including headaches, problems paying attention, and difficulty studying or understanding material, according to a new study published online in the journal Pediatrics. The study's authors examined 349 students between the ages of 5 and 18 who sustained a concussion and underwent an initial evaluation within 28 days of the injury. Parents of all 349 students reported their children's postconcussion symptoms, and 239 of the students did the same. Clinicians divided the children into two groups: those who had recovered from their concussions, based on a lack of symptoms and no impairments on neurocognitive testing, and those who had not yet recovered from their concussions, based on elevated symptoms or impaired performance on neurocognitive tests. Among the 109 students who had fully recovered from their concussions by the time of the study, just five reported having headaches interfere with their academic work, eight reported having problems paying attention, and 11 said they were feeling too tired. Of the 240 who had not yet recovered from their concussions, however, 121 had headaches interfering with their work, 106 had problems paying attention, and 95 felt too tired. Likewise, a far greater number of students who had not yet recovered reported having to spend more time on homework, difficulty understanding material and studying, and difficulty taking class notes. In total, 88 percent of the group still recovering from a concussion reported at least one school problem related to their concussion symptoms, such as headaches, fatigue, or concentration problems. In addition, 77 percent reported having some form of diminished academic skills, such as problems taking notes or studying. Among the fully recovered group, just 38 percent had symptom-interfering problems and 44% had a diminished academic skill. The fully recovered students reported consistent interfering symptoms and diminished academic skills across all age groups. The still-recovering group reported consistent interfering symptoms as well, but their diminished academic skills varied by age level. High school students in the latter group reported a greater number of academic-skill problems than middle and elementary school students. The study's authors did find a positive correlation between symptom severity and the total number of school problems reported by students and parents. "The range of reported postinjury school problems suggests the need to provide actively symptomatic students with targeted supports during the postinjury recovery period," the authors conclude. The American Academy of Pediatrics made a similar recommendation in a 2013 clinical report, saying schools should create a multi-disciplinary team to ease a student-athlete's transition back to the classroom after he or she sustains a concussion. "We know that children who've had a concussion may have trouble learning new material and remembering what they've learned, and returning to academics may worsen concussion symptoms," said Dr. Mark Halstead, a lead author of the AAP's report, at the time. A handful of states have already begun taking matters into their own hands. The Illinois Senate recently approved a bill that would require schools to create a concussion oversight team responsible for establishing both a return-to-play and a return-to-learn protocol. Both Virginia and Nebraska implemented similar return-to-learn requirements for student-athletes last year. By Daniel B. Peters, Ph.D.
"Yes, we see that he has trouble reading fluently and has trouble with writing and has been diagnosed with dyslexia and dysgraphia, but he is meeting minimum grade expected levels..."
"We agree that your daughter has challenges with focus and attention and was diagnosed with ADHD but she is doing fine compared to other kids in her class. We have so many who struggle so much more..."
"I understand that your child has Asperger's Disorder and has trouble with social skills and transitioning but he is doing fine academically..."
After attending countless IEP (Individualized Education Plan), 504, SST (Student Success Team), and RTI (Response to Intervention) meetings over the years, I now hear these phrases in my sleep. And I usually wake up with a start and a grimace as I recall what almost always is the final sentence, "Your child does not qualify for an IEP or Section 504 Plan." I have been testing and advocating for children and students for approximately 20 years as a psychologist and also as a father of three. Over the years when students struggled in the classroom - with learning or behavior - they were referred for comprehensive testing, and then after I provided results he or she usually qualified for a special education plan through an IEP or 504 Plan to address their needs. It is just the way it was and it worked. Then, about 10 years ago things changed. A perfect storm was unfolding. 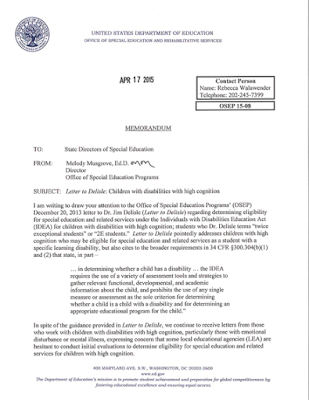 Following on the heels of the No Child Left Behind Act (NCLB) in 2001, the Individuals with Disabilities Education Act (IDEA) was re-written and re-authored in 2004. A new program called Response to Intervention (RTI) came to the fore, and then the U.S. economy, and the education budget, went into decline. The goal of RTI was to intervene in the classroom for all kids who were having problems learning and not performing to grade level standards, rather than waiting for them to qualify for special education. This program was created to help struggling learners receive intervention early, and in their classrooms, in order to keep up with grade expectations. This program served several purposes - it helped all kids who were identified as struggling learners and reduced the need for comprehensive assessment from school psychologists to determine the presence of a disability. This program has worked for many children, but has largely failed the kids we call and categorize as 2E (Twice-Exceptional). 2E students are both gifted in one or more areas of intellect, academic, performing arts, visual arts, and/or leadership ability, AND also have a disability in one or more areas of learning, processing, emotional, developmental, and/or physical ability. Thus, 2E students fall at both ends of the bell curve. Put another way, they are both hot and cold, or both advanced and behind. You know these kids. They have advanced verbal and reasoning abilities and sound like an adult or professor, yet lose their homework, don't track time, have sloppy handwriting, and can't sit still. They build amazing and intricate Lego designs but can't spell. They are experts in topics of their interest and can't remember basic math facts. They are amazing artists who can't be with crowds (or in bustling classrooms! ), avoid people, do not tolerate loud sounds, and have limited food preferences. So why don't these kids get tested and qualified for special education like others with needs? It is because education policy (NCLB and RTI) became focused on getting all kids to meet "minimum grade level requirements" and a policy driven effort to intervene in the classroom for all struggling learners, rather than waiting for them to qualify for an IEP. I want as many children helped as possible and many of these initiatives for the masses do help. However, 2E kids have fallen through the cracks since they are able to compensate, due to their advanced cognitive abilities, to perform at an ever-sliding acceptable statistic of "grade level" (today some states and districts have set the cut-off as low as the 12th or 16th percentile as meeting minimum grade level standards). Here's the problem: If bright kids do not perform below grade expected levels, they are not seen as having a problem, don't receive intervention, and don't get referred for comprehensive assessment for special education eligibility. As a result, 2E students have been missed, misunderstood, and marginalized. The consequences are significant - underachievement, depression, anxiety, behavioral problems, low self-esteem, and school drop out. It has been about 2 and a half years since a small group of colleagues met with the Melody Musgrove, Director of Special Education, and Michael Yudin, Acting Assistant Secretary of Office of Special Education and Rehabilitative Services to present our paper Critical Issues in the Identification of Gifted Students With Co-Existing Disabilities: The Twice-Exceptional (Sage Open) and to discuss 2e students not receiving IEPs and 504s. It's been one year since I posted here on HuffPost Gifted+Learning Disabled = No Desk For You, Says New Study when I discussed The National Center for Learning Disabilities data from the U.S. Department of Education that "students with learning and attention issues are shut out of gifted and AP programs, held back in grade level and suspended from school at higher rates than other students." It is now 2015 and it is time for educators to stop looking the other way, to stop saying "she is fine enough" "he is meeting grade expected levels," and "your child is doing much better than other kids with problems" and for students with real and legitimate diagnoses of ADHD, dyslexia, dysgraphia, auditory processing disorder, sensory processing disorder, or autistic spectrum disorder to receive the evaluations and ultimately the educational help they qualify for. 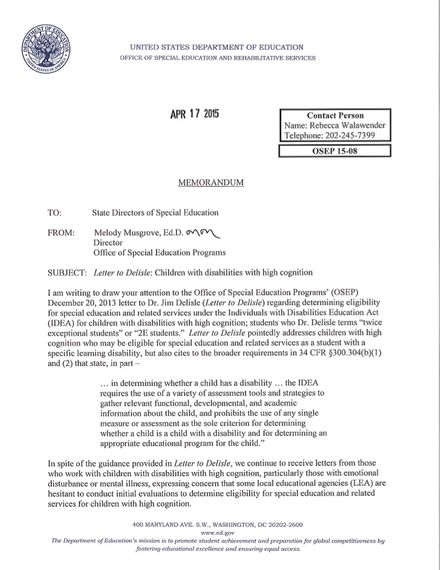 Last week Melody Musgrove released a letter to all State Special Education Directors across the U.S. to disseminate crucial information. Her letter states all children and families have the legal right to an evaluation. 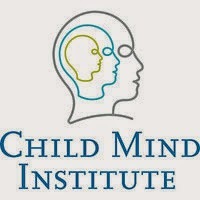 "...in determining whether a child has a disability...the IDEA requires the use of a variety of assessment tools and strategies to gather relevant functional, developmental, and academic information about the child, and prohibits the use of any single measure or assessment as the sole criterion for determining whether a child is a child with a disability and for determining an appropriate educational program for the child." Ms. Musgrove adds, ..."we continue to receive letters from those who with children with disabilities with high cognition...expressing concern that some local educational agencies (LEA) are hesitant to conduct initial evaluations to determine eligibility for special education and related services for children with high cognition...remind each LEA of its obligation to evaluate all children, regardless of cognitive skills, suspected of having one of the 13 disabilities..."
Make 2015 the year that 2e kids stop struggling daily, stop underachieving, stop falling behind, stop experiencing anxiety, depression, and low self-concept and self worth and start to flourish because they have comprehensive assessments, appropriate education plans, interventions and accommodations. Your child has a right to get help and learn - and not get left behind -- just like every other student. After clusters of high school suicides in California, Virginia and Massachusetts, we look at the pressure parents put on teenagers to succeed. recorded on the reservation between 2004 and 2013. Three Palo Alto, California teenagers took their own lives this winter. And it’s happened there before. In Newton, Massachusetts, three teens committed suicide last year. And another three in Fairfax County, Virginia. Is there too much competition in these hyper-competitive communities? Psychologists tell us that suicide clusters are rare. And caution against singling out any one factor. But with one in four kids now with a clinical diagnosis of depression or anxiety — something’s going wrong. Palo Alto Weekly: Keep Calm and Parent On — “There is no single cause of suicide — the act can arise from any combination of multiple factors — biological, environmental, psychological and situational. As a community, we agree that whatever can be done to mitigate these factors must be done; where we disagree, however, is where one might expect: What does “whatever can be done” entail? Our public debate continues — in community meetings, in online forums, in newspaper letters, in school board and city hall meetings. But for me, on line at Starbucks, in the aisles of Safeway, at school campus pick-up or drop-off, this public debate echoes much more private and personal implorations. TIME: American Teens Are Stressed and Bored. It’s Time to Talk About Feelings — “A growing body of research highlights the importance of how kids feel and how they manage those feelings, or not. Emotions drive attention, learning, memory, and decision-making. They affect relationships and psychological well-being. Young people with disabilities, including high school and college students, as well as young adults looking for their first job, are invited to apply to participate in a career exploration workshop. Questions or accommodation requests should be directed to Nora Nagle, Museum of Science ADA and 504 Accessibility Coordinator, at: (617) 459-4084. You can make a difference in a student's life. Sign up below for a training near you! Join us in our efforts to help students in Massachusetts reach their academic potential. Become a Special Education Surrogate Parent for a child in your community who needs a voice in the classroom. Special Education Surrogate Parents (SESPs) make special education decisions for students in Massachusetts whose parents are unknown or unavailable. They meet with their assigned student or observe them in the classroom, receive all progress reports, and attend all IEP meetings as the student's educational decision maker. Take the next step and register for an orientation! Click on the link to the training to view more details and register for that date. RSVP using the links above, or visit www.fcsn.org/rtsc/events/ and click on a specific orientation. You can also register by contacting Hannah at hstallkamp@fcsn.org or (617) 399-8342.